How to subscribe to OnePageCRM? 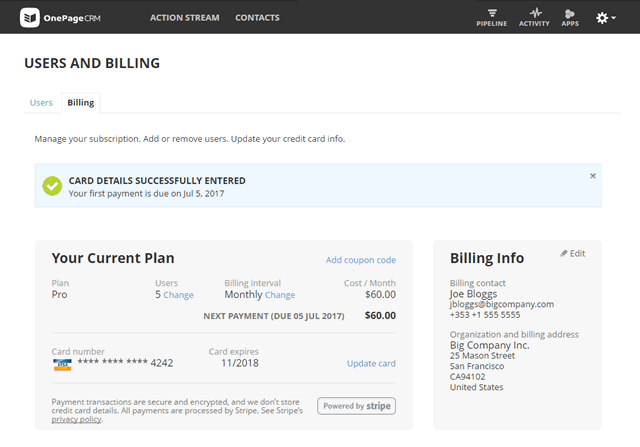 Under Billing, update your Billing Info by clicking on the Edit link (see B). Please note that this info will appear on your OnePageCRM invoice. 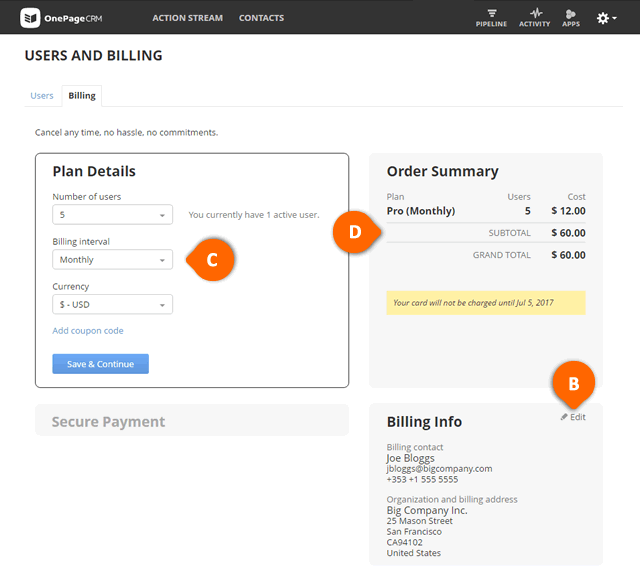 Under Plan Details (see C), select your preferred Number of users, Billing interval and Currency and click on Save & Continue. Under Order Summary (see D) on the the right displays the breakdown of your charge based on the selection made in Plan Details. In the expanded Secure Payment section, enter your credit card details, tick I have read & accept the Terms of Service and click Subscribe now (see E). You have successfully subscribed to OnePageCRM. Please note that your credit/debit card will be charged only after your Trial expires. 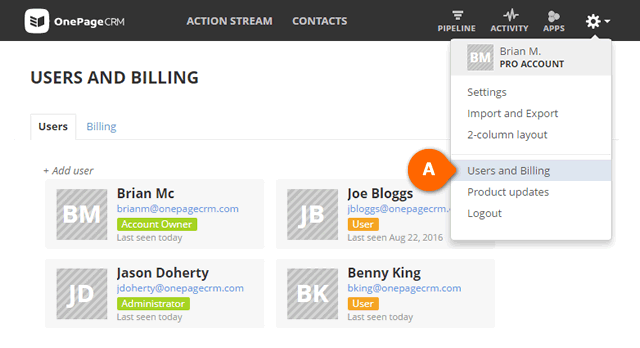 OnePageCRM is an Irish registered company. Irish customers are liable to 23% VAT. Customers with a valid EU VAT number (except Irish VAT) will be charged 0% VAT as per Intra-Community Trade agreement. 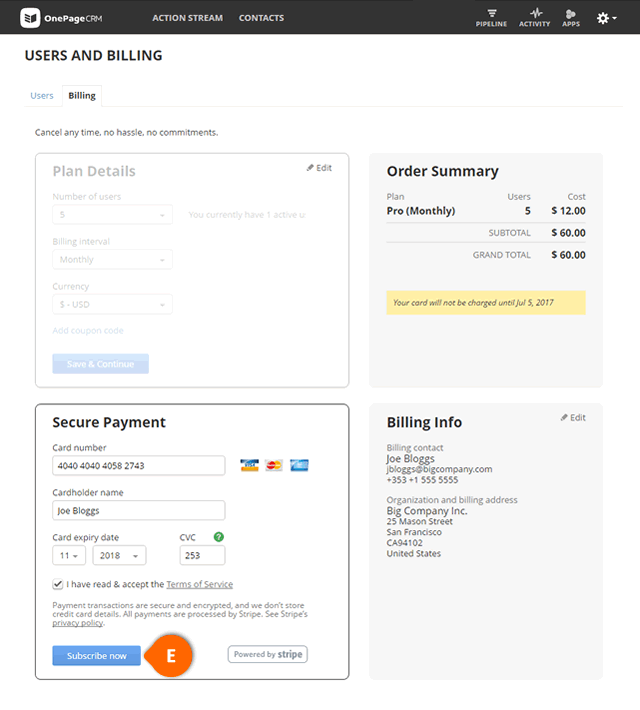 To be VAT exempt, please update your Billing Details on the Subscription page (see Step 3 above). Customers without a valid EU VAT number will be charged VAT at the rate of the country they are based in.